This curious surname is of Anglo-Saxon origin, and is a locational name from Heavyside, an estate east of Biggar, in Lanarkshire, Scotland. The component elements of the placename are believed to be the Olde English pre 7th Century personal name "Hefa", with the Olde English "side", side, slope of a hill (especially one extending for a considerable distance); hence, "Hefa's side". Heavitree in Devonshire, recorded as "Hefatriwe", circa 1130, took the form "Hevetre" in the Feet of Fines for that county, ated 1201. Locational surnames were originally given to local landowners, and the lord of the manor, and especially as a means of identification to those who left their birthplace to settle elsewhere. 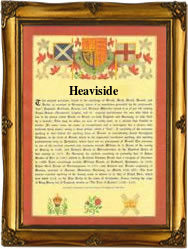 Regional and dialectal differences subsequently gave rise to several variations on the original spelling of the name, and from the mid 16th Century on, the surname appears as: Hevisydes, Heviside, Havesides, Hiviside, Heviseed, Heveside, Heaviside and Heavyside in Church Registers of Northern England. On January 10th 1574, Richard Heviside, an infant, was christened at Gateshead, Durham, and on April 23rd 1662, Mary, daughter of Christopher Heavyside, was christened in the same place. The marriage of Hannah Heavyside to Thomas Wilkinson took place at Hutton Rudby, Yorkshire, on March 24th 1788. The first recorded spelling of the family name is shown to be that of John Hevisydes, which was dated May 19th 1552, witness at a christening at Leconfield, Yorkshire, during the reign of King Edward V1, known as "The Boy King", 1547 - 1553. Surnames became necessary when governments introduced personal taxation. In England this was known as Poll Tax. Throughout the centuries, surnames in every country have continued to "develop" often leading to astonishing variants of the original spelling.